MkIV from 1966 has disc wheels and better trim and optional 115 bhp engine. 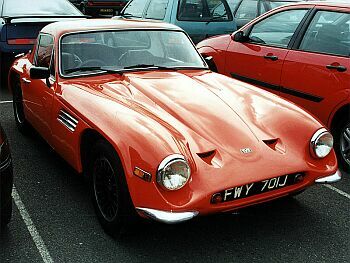 TVR ENGINEERING, LTD, is the name of a new company that has taken over the production of TVRs in Blackpool. About three to four of the MGB-engined 1800Ss are being produced per week, while the V8 Ford-engined Griffith is also available to special order. Directors of the new company are Arthur Lilley and Martin Lilley-they are also directors of the Barnet Motor Co, Victoria Road, Barnet, Herts, where all TVR enquiries should now be addressed. The Barnet Motor Co are well-known on the racing circuits Martin Lilley drives a TVR Griffith and sales manager Gerry Marshall has scored many successes with a competition Lotus Elan.